The release of Maptek Vulcan 64-bit has been one of the most anticipated events in mining software in a long time. Users of Maptek Vulcan’s mine modeling software have been looking forward to the 64-bit version ever since their first error message: 'no more free graphics device segments'. This new version promises to take advantage of all of the increased RAM memory in today’s modern computers. The popular belief was that the new version would be able to load more data, load it faster and without changing from small to larger Dynamic Memory settings. In reality, it has been plain to me for a while that access to increased memory limits should allow you to load more data but at the same processor speed, effectively making the software seem even slower than it already is. I’ve had some time to work with Maptek Vulcan 8.1.4 64-bit and have to say that I am very pleased with the results. The ability to load more data on the screen is a huge advantage. If I have to load data at the old speed and wait a little longer for a response, I can live with that. 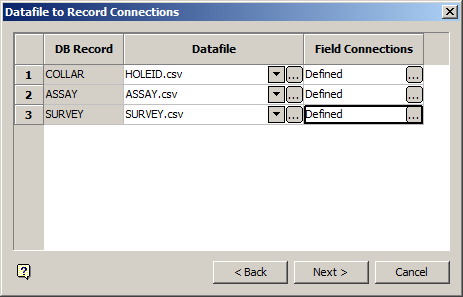 Just save me from the ‘no more free graphic device segments’ error. 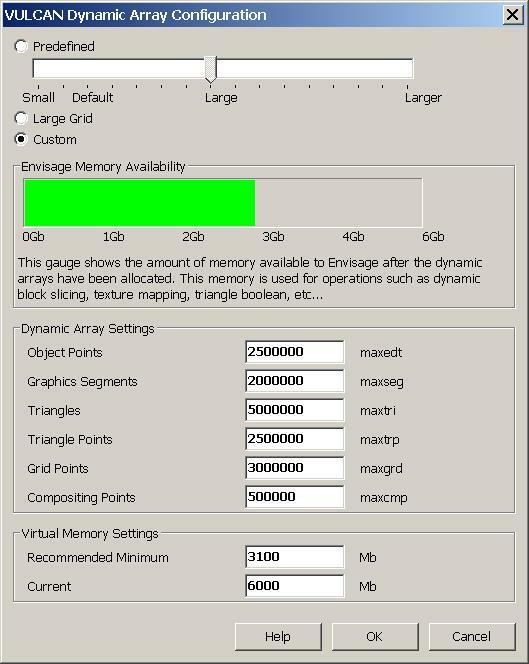 The Dynamic Memory settings in Maptek Vulcan allocate how much memory is given to two processing groups. The first group is for loading CAD data and triangulations/grids on the screen. This is the memory you are increasing when you increase the Dynamic Memory to ‘Larger.’ This memory allows you to load large triangulations or your entire topo strings layer, it also restricts the amount of memory available to apply to the second process, crunching numbers. Number crunching applies to block model processes and all background calculations. Loading a block model slice on screen is actually memory intensive for this second process group. A common mistake for Maptek Vulcan users is to increase Dynamic Memory when a block model slice won’t load when, in fact, the opposite would solve the problem. Recently, I have been having troubles with the Dynamic Memory settings in Maptek Vulcan 32-bit. I have large topography triangulations that I work with on a regular basis. I also have a correspondingly large block model whose slices I need to load frequently. 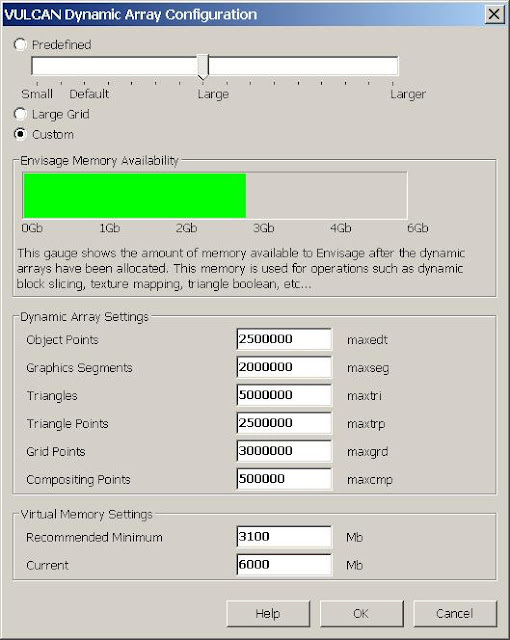 I have been constantly going back and forth between large 'custom' Dynamic Memory settings to view the triangulations and 'default' Dynamic Memory settings to view the block model slices. The 64-bit version of Maptek Vulcan has saved the day. With access to more memory I can now leave the Dynamic Memory settings at my 'custom' (larger than 'Larger') settings and still display the block model slices with the same settings. This is a huge improvement. The upgrade to 64-bit software isn’t the end-all of great programming. Remember that your processing speed is still the same so when working with really large datasets the wait time can be tedious. Another thing that I don’t understand is the warning I get with my custom Dynamic Memory settings. I still get the error: “MAXSEG is larger than 100,000. This is above the recommended value, but is still valid.” Why is this error message still here? Isn’t the point of a 64-bit version, that I CAN load datasets with more than 100,000 points? Remember that the error for too many Graphics Segments will come up but can be ignored. Increasing processing speed. The ability to load more data needs to be supported by loading that data (and working with it) faster.